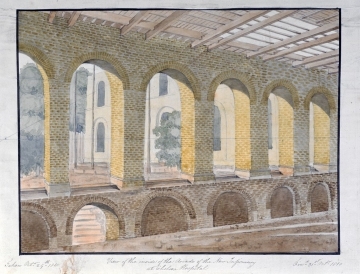 The foundations were laid from June 1810, after the Board of Commissioners had (finally) approved the design. 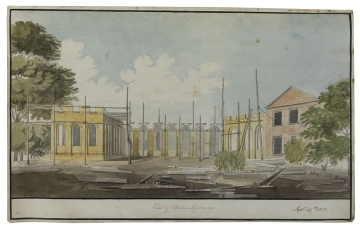 Progress views were being made throughout September and October 1810. Bar drawings 85 and 83 all of these drawings show parts of the older structure of Yarborough House, as in the previous group. 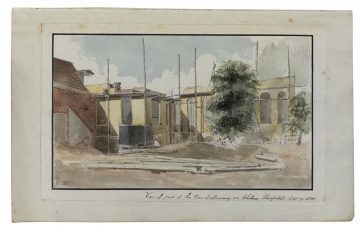 Godfrey indicates that the chimney stack of the old building was aligned with the position of the fireplace of the new Infirmary, thus Soane must have relied heavily on the older structure. Indeed, Soane re-used the brickwork of the old house wherever possible (although encasing the old material in new yellow stock brickwork). 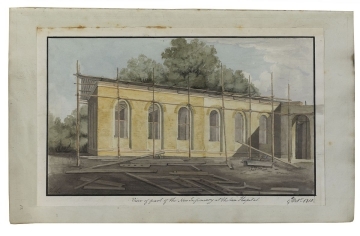 Godfrey goes further to suggest that this south wing of Yarborough House may in fact have been the extension constructed under Walpole's ownership and of Vanbrugh's design, given the heavy moulding of the ceiling and the old fashioned marble mantelpiece. 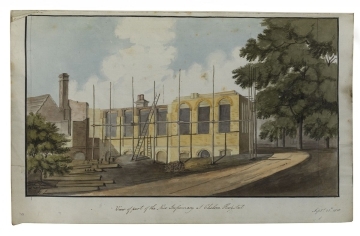 (The evidence for Vanbrugh's involvement with this building is built on a letter from that architect to Walpole providing an estimate for work and signed 'your most humble architect' on 27 October 1725). 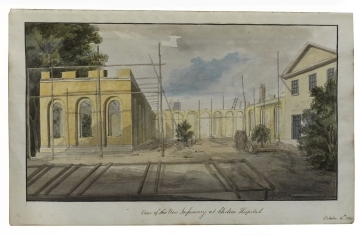 It would seem in keeping with what we know of Soane that he may have particularly wished to keep this part of the building, if it had an established connection with such a renowned architect as Vanbrugh. 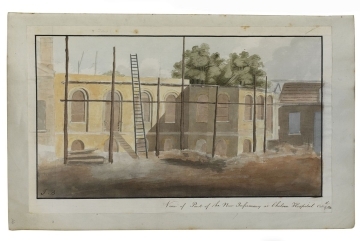 The representation of Yarborough House also shows that the south-east wall, as indicated in drawing 81, was entirely without windows, owing to the fact that it looked onto the Hospital airing grounds.